Dr. Bhupindar Singh is Assistant Professor of Medicine at Creighton University School of Medicine and Executive Director of Research and Medical Affairs for ZS Pharma. He discusses his late-breaking abstract, Hyperkalemia and Serum Potassium Variability in Patients on Hemodialysis, with Nathaniel Reisinger (@nephrothaniel), AJKDBlog Guest Contributor. AJKDBlog: What would you tell AJKDBlog about your poster? Dr. Singh: We performed an observational study looking at potassium variability in stable patients on hemodialysis. We enrolled 240 patients at 17 research sites in the US and followed them for 12 days. Patients had a mean age of 57 years, and were receiving an average of 230 min of hemodialysis per session. We checked serum potassium (along with other electrolytes) before and after dialysis as well as on inter-dialytic days to determine the potassium variability in this population. For a subset of 200 patients, we performed cardiac rhythm monitoring for the duration of the study using a wearable cardiac rhythm monitoring device. This was performed to assess the burden of cardiac arrhythmia in this population. We found that patients on 1K-2K dialysate had significant fluctuations in serum potassium levels, ranging from hyperkalemia to hypokalemia. The incidence of post dialysis hypokalemia was 79%. In the 3K-4K population it was 12%. We also found, to our surprise, that 51% of the patients developed atrial fibrillation during this short 12-day period. The majority of these patients did not have a previous diagnosis of atrial fibrillation and had paroxysmal episodes. More concerning is that we also found that 16% of this stable hemodialysis population had unrecognized cardiac arrhythmias such as ventricular tachycardia and pauses. AJKDBlog: What do you think is the next step? Dr. Singh: These preliminary findings warrant further research to better characterize these arrhythmias and put in place therapeutic interventions to detect them and if possible prevent and treat them in a timely manner to reduce their impact on patient outcomes. We are working on correlating the appearance of these arrhythmias with changes in electrolytes and blood pressure to see if we can develop a pattern when these arrhythmias appear. AJKDBlog: What was the most significant take-home point you learned in doing this study? Dr. Singh: We found significant potassium variability in the 2K dialysate group versus 3K group. The question to answer is whether there is merit in trying to achieve a higher potassium dialysate which may help reduce potassium variability and avoid detrimental episodes of post-dialysis hypokalemia. Also, we found a surprisingly high burden of cardiac arrhythmias in this relatively stable dialysis population. This needs to be explored further by the nephrology and cardiology communities. AJKDBlog: Do you have anything else you want to add? Dr. Singh: Prevention of potassium fluctuations might be critical to improve outcomes in dialysis patients. Bringing to these patients’ better tools and devices to monitor their cardiac rhythm and correlate them with their electrolyte levels is needed to detect, prevent and treat in timely manner these arrhythmias. Dr. Paul Friedman’s group at the Mayo Clinic is developing a signal-processed ECG technology which could be used to estimate serum potassium values. If validated, this could allow non-invasive potassium assessment using hand-held or wearable devices. We are actively collaborating with Mayo Clinic and other groups to develop user-friendly tools and devices to improve the management of hyperkalemia in CKD patients. Finally, I want to thank the patients and investigators who participated in the study. AJKDBlog: Thanks for taking the time to do this interview, Dr. Singh! 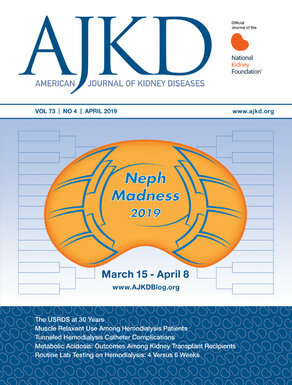 NKF Spring Clinical Meetings late-breaking abstracts are freely available in the May 2017 issue of AJKD. Check out more AJKDBlog coverage of NKF’s 2017 Spring Clinical Meeting (#SCM17)!